I have been a professional graphic designer for 24 years. 18 of which have been as founder and creative director of Tomko Design. LOGOS, NAMING, BRAND DEVELOPMENT, LETTERHEAD, BROCHURES, ANNUAL REPORTS, ADS, POSTERS, PACKAGING, TRADESHOW MATERIALS, INTERACTIVE, WEBSITES, SIGNAGE, WAY-FINDING, WEARABLES, EDITORIAL. . . I was born at an early age in Dayton, Ohio with a pencil and sketchbook in hand. While growing up in Dayton, Eastlake, Euclid, etc.. I doodled my way through kindergarten and elementary school. In 1981, during 5th grade, my family moved to Arizona. That pencil never left my hand and I soon found that moving to the Wild West meant I needed to be a quick draw. Keeping friends and teachers entertained with my characters and drawings I finally made my way to Peoria High where I focused on art and skateboarding, not to mention taking some classes at Glendale Community College just to up my game before graduating from PHS in ’90. My good friend Paul introduced me to snowboarding in ’89 which motivated me to choose to attend Northern Arizona University where snowboarding became the new skateboarding. The pencil and sketchbook seemed to be even closer these days as I was studying graphic design while taking drawing, painting, printmaking, handlettering and other courses to keep that pencil sharp. I graduated in 1994 with a BFA from the School of Communications. Upon graduating from NAU, I moved up to Benicia, CA to take on the role of designer for .Verb Design and Advertising after an introduction with the owner Holden Hume by way of famed painter and previous classmate Joe Sorren. Verb Design specialized in graphic design for the action sports industry. 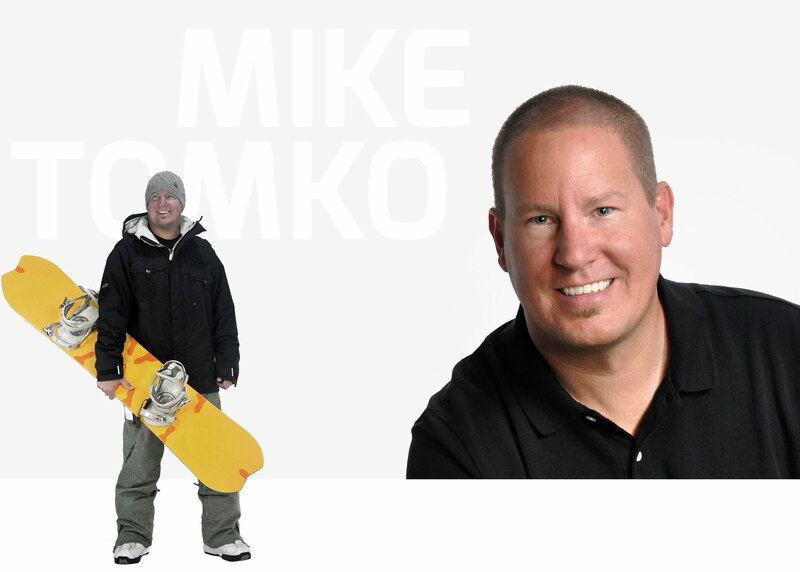 Mike’s love of snow, skate and surf was further nurtured while designing snowboards, bodyboarding magazine, brochures, ads, logos and the like. This wasn’t just work and fun, but a serious design development time for me. Not only did I leave with more knowlege and a killer portfolio, but I created strong friendships during my two years there. I moved back to Arizona to work for CFD, one of the most recognized firms in Arizona at the time. The work was for larger corporate clients, as well as the professional sports teams in Arizona. Another growing period in my constant pursuit of design excellence. After working at CFD for just shy of 5 years, I struck off on my own. With Nocturnal Project already a year underway, I worked for the first time with my own client base. The Nocturnal Project quickly turned into Tomko Design. As of 2018 I am celebrating 18 years of Tomko Design, my independent design venture, and over 24 years as a professional designer. I continue to develop as a designer and look forward to working with, and meeting, interesting people and clients. It all started as The Nocturnal Project in 1998 because I initially worked in the evenings. In 2000 I changed it to my namesake, Tomko Design.